Why Some People Have a Better Chance of Surviving When Survival is Necessary (pdf) Dr. Siebert explains why some people are more likely to survive deadly crises than others. How Resilient Are You? Take the quiz courtesy of The Resiliency Center. Why some people have a competitive advantage in today's world. OPRAH! "Would You Survive?" Program. An in-depth article about the program and the survivors. About surviving, creative coping, resilience and thriving. Contributions solicited. Read Other Stories. Lose your job through no fault of your own? Here are valuable guidelines on how to cope, be resilient, and thrive. Guidelines on how to tell your survivor story. 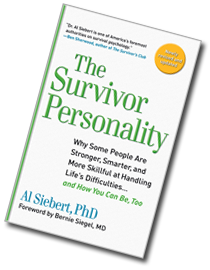 "Life is Not Fair," Chapter One from The Survivor Personality by Al Siebert. Resiliency Resources at THRIVEnet's Bookstore. Two excellent student success books for college students. Guidelines for Listening to Veterans and Survivors of Traumatic Situations. About THRIVEnet founder Al Siebert. Valuable Articles: Resiliency and Longevity, Caregiver Resiliency and more. Survivor Guidelines.org for survivors of terrorist acts and traumatic events. The Resiliency Center.com to help develop resiliency in yourself, your work teams, and your organization. Resilitator.com connect with resiliency professionals and community.